2 *Minimum Requirements Recommended Requirements IntraVet 4.5 Hardware Requirements File Server Workstation Intel Core2Duo Processor 4 GB RAM 40 GB Hard Drive¹ Ethernet 10/100 Network Card Keyboard and mouse or KVM switch box 17 LCD Monitor (capable of 1024x768) Intel USB Chipset with at least 2 powered USB 2.0 Ports Supported Operating Systems: Windows Server 2000 SP4 **Note: Will no longer be supported with versions higher than IntraVet 4.00 Windows Server 2003 SP2 Windows Server 2008 Windows Server 2008 R2 Windows Server 2012 Standard Windows XP Professional SP3 Windows Vista Business SP1 Windows Vista Ultimate SP1 Windows 7 Professional ***See notes below for operating system exclusions. Intel Core2Duo Processor 2 GB RAM 20 GB Hard Drive Ethernet 10/100 Network Card 17 LCD Monitor (capable of 1024x768) Keyboard and mouse or KVM switch box Intel USB Chipset with at least 2 powered USB 2.0 Ports Supported Operating Systems: Windows 2000 Professional SP4 (will no longer be supported with versions higher than 4.00) Windows XP Professional SP3 Windows Vista Business SP1 Windows Vista Ultimate SP1 Windows 7 Professional Windows 8 Professional ***See notes below for operating system exclusions. Intel Xeon Processor 8 GB RAM** 1 TB 7200RPM SATA2 or faster, mirrored 1 (RAID 1) DVD-ROM Drive Gigabit Ethernet Adapter Keyboard and mouse or KVM switch box LCD Monitor (capable of 1024x768) Intel USB Chipset with at least 4 powered USB 2.0 Ports Supported Operating Systems: Windows Server 2003 SP2 Windows Server 2008 Windows Server 2008 R2 Windows Server 2012 Standard Windows XP Professional SP3 Windows Vista Business SP1 Windows Vista Ultimate SP1 Windows 7 Professional ***See notes below for operating system exclusions. **Note: To be able to utilize more than 4 GB of RAM in your server you will need to use a 64-bit OS Intel Core i5 Processor 4 GB RAM 250 GB or larger Hard Drive DVD-ROM Drive Gigabit Ethernet Adapter LCD Monitor (capable of 1024x768) Keyboard and mouse or KVM switch box Intel USB Chipset with at least 8 powered USB 2.0 Ports Supported Operating Systems: Windows 2000 Professional SP4 (will no longer be supported with versions higher than 4.00) Windows XP Professional SP3 Windows Vista Business SP1 Windows Vista Ultimate SP1 Windows 7 Professional Windows 8 Professional ***See notes below for operating system exclusions. 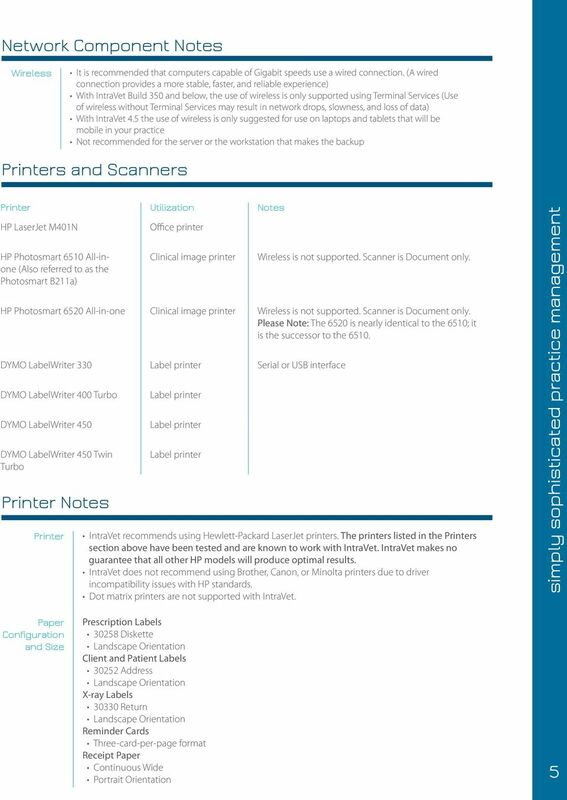 ¹The use of Digital Integration, attaching images or documents to patient records and/or being paperless may require additional hard drive space. 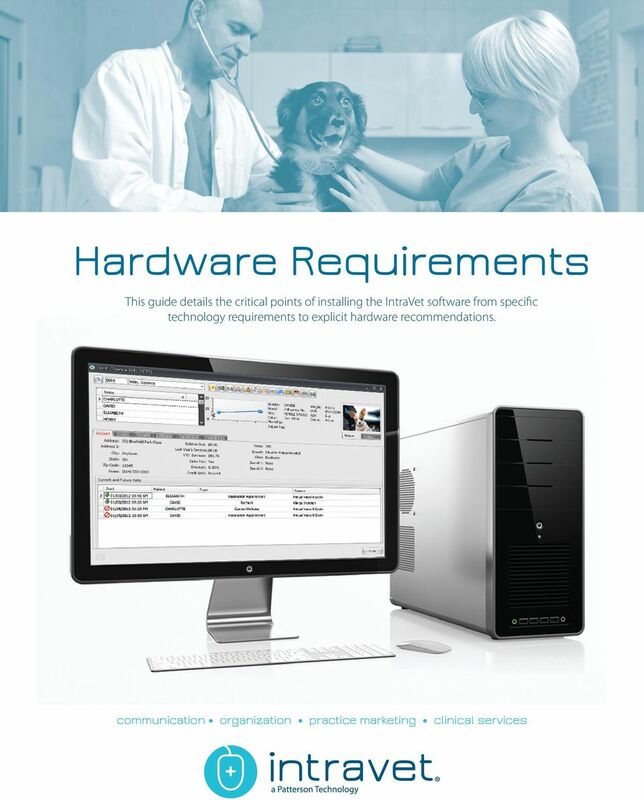 Although IntraVet will run on the minimum specifications listed, you may not experience the same level of performance as you would when running off of the recommended requirements. 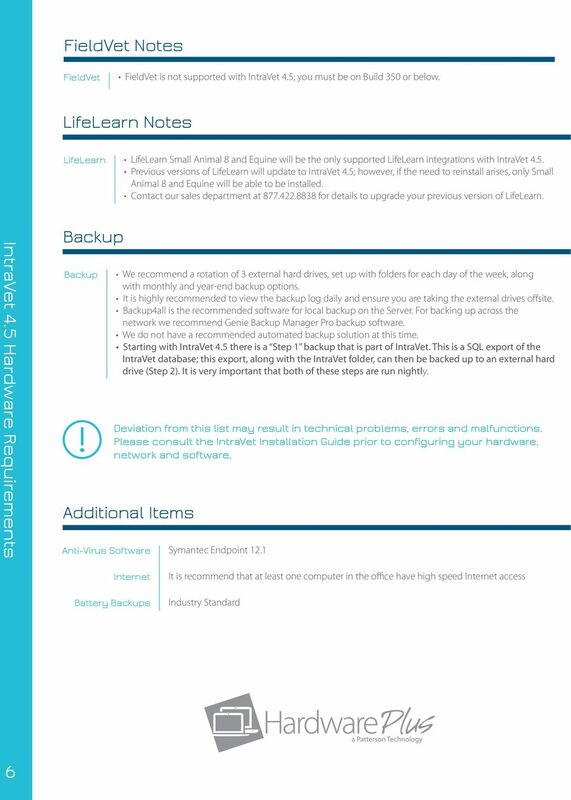 *Note: Your practice may not experience optimal performance when only meeting the minimum requirements and hardware upgrades may still be needed. 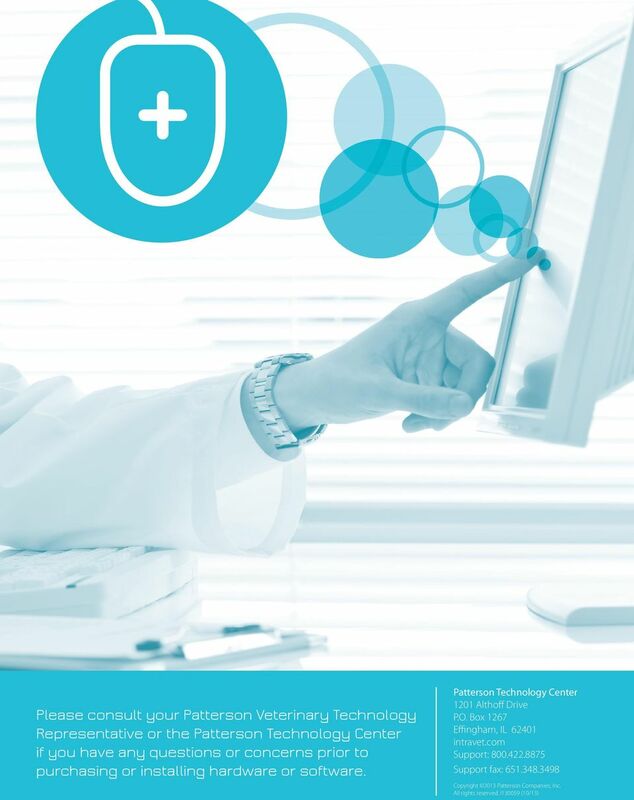 Speed and performance are impacted by many variables such as the network, number of computers, third party software use and the general workflow of your practice. 2 **Note: While a 64-bit OS is able to work with IntraVet Build 300 and higher, this does not mean that all peripherals including lab machines have drivers available for them. Please refer to the manufacturer s specifications for driver compatibility. Server 2003 X64, XP 64-bit and Vista 64-bit are not supported 64-bit OSs. 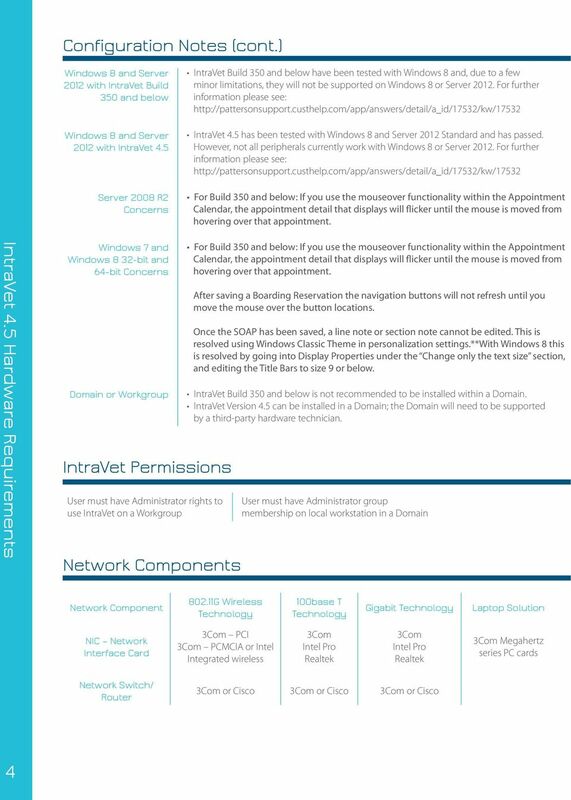 *** Note: Windows 7 and Server 2008 operating systems are only supported on IntraVet Build 300 and higher. 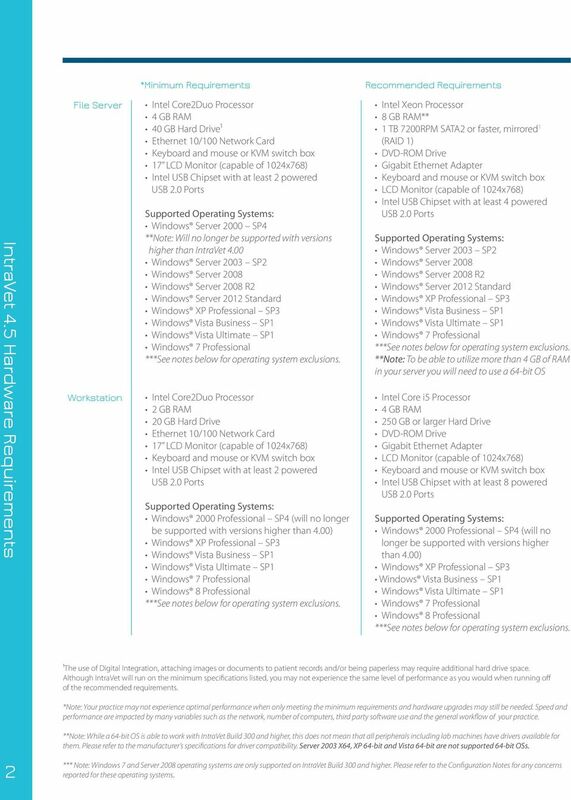 Please refer to the Configuration Notes for any concerns reported for these operating systems. 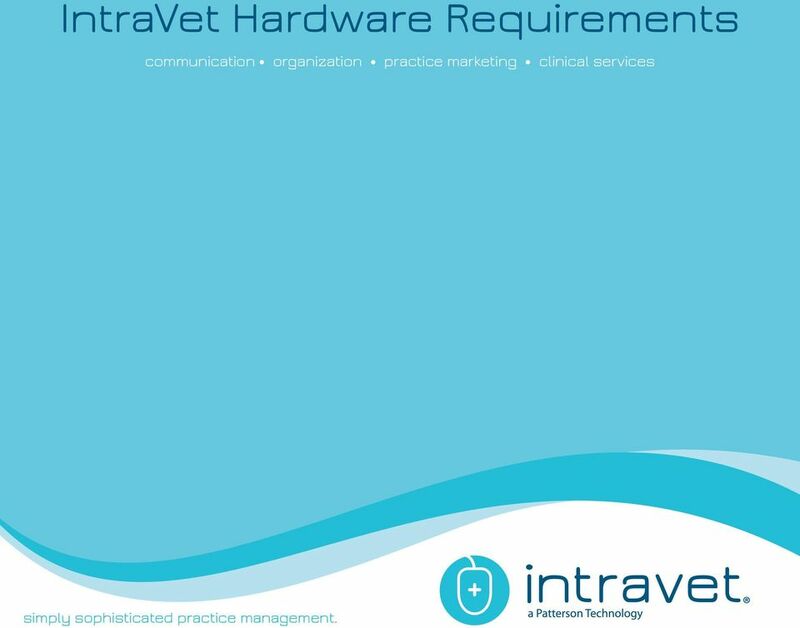 8 IntraVet Hardware Requirements communication organization practice marketing clinical services simply sophisticated practice management. 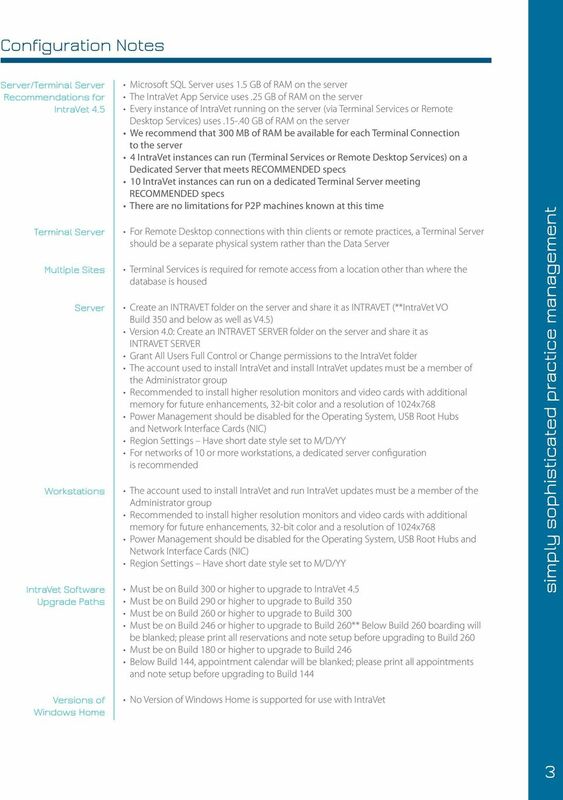 Hardware and Software Guidelines for Customer Hosted Systems Version Date: June 17, 2016 Rapattoni Magic-Cloud AMS real estate association management software represents a huge step forward in technology. Volume: 254 Questions Question No : 1 Which of the following network devices filters traffic of many different protocols based on a predetermined set of rules established by a system administrator? A.
Microsoft SQL Server 2008 R2 Express.